The surprising truth about Chief Knowledge Officers is that a significant proportion of them know very little about Knowledge Management, at least according to their Linked-in profiles. We all know that these endorsements can be a bit dodgy, with people endorsing other people they barely know, for skills they don't know whether they have. However these skills lists at least give a rough indication of what people are professionally recognised for. You would expect, for Chief Knowledge Officers, that Knowledge Management would appear high on that list of skills, wouldn't you? After all, if you are Chief of a discipline, you should have a good understanding of that discipline. You don't need to be a world expert - in fact we recommend that CKOs should be appointed from within and should develop their skills on the job rather than appointing KM experts - but you would still expect to see "Knowledge Management" somewhere high in that list, surely? The truth is rather different - at least half of the time. 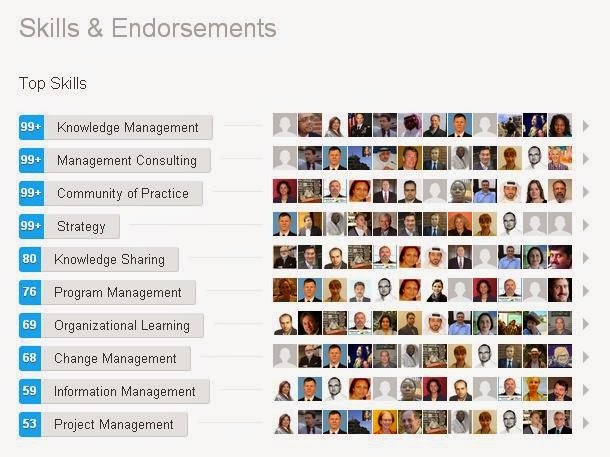 I looked at the profiles of 50 CKOs in Linked in - people with "Chief Knowledge Officer" in their current job title - and I counted how far down the list of skills you had to go before you found "Knowledge Management". The results are shown below. (Note however that this job title seems disproportionately popular at the moment in the military and legal fields, so these fields are over-represented in the sample). 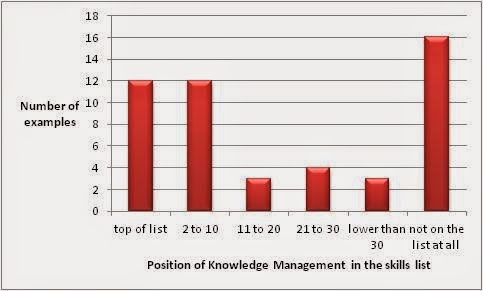 The good news is that 24 out of the 50 have "Knowledge Management" in their top ten skills, and 12 out of 50 have it right at the top of the list. The surprising news (to me anyway) is that nearly half of the CKOs do not have KM in their top 20 skills, and 16 out of 50 - about a third - do not even have it on their list of skills at all! It seems to me that we have two types of CKOs out there, with a fairly even split between the two. Another type, for whom the CKO role has little (or nothing) to do with KM. It's the second type that puzzles me. Perhaps the job was titled "CKO" because it sounded good and important rather than because it had anything to do with the management of knowledge, or perhaps the CKO plays purely an oversight and coordination role, and leaves the KM aspects to Knowledge Managers? Perhaps they manage the initiative rather than the knowledge? Whatever the reason, I remain surprised by the results. In my organization, that is not that small, there's a KM board, mainly consisting of some guys from public relations who barely know one thing about KM. It is so awkward.